Some time ago, TECHknitting posted on "how to knit I-cord." Since then, however, a nifty new tool (machine?) has become indispensable here at ChezTECH--an I-cord mill. My recent love of these gadgets surprises me. From reading reviews and talking to knitters, I-cord mills seemed expensive and prone to malfunction. However, as more and more projects demanded I-cord, another look was in order. So, when a German-made I-cord mill jumped into my basket at the LYS, I didn't put it out again despite the expen$e, but paid and took it home. Once home, I read the instructions, threaded the mill and started cranking. Disaster! The stitches skipped. The needles snagged. The end result was a terrible, loopy mess. Changing yarns did not help. Although sock yarn made a better result than anything heavier, the results were still un-usable. If one project after another hadn't called for I-cord, the mill would have stayed in the reject basket along with the snapped bamboo needles and the bent dpn's. Yet laziness eventually won out: each time an hour or three was spent mindlessly churning out I-cord by hand, I would think "there HAS to be a better way." Out would come the mill for another try. After several months, experience showed how to make a few inches of passable cord. Frustratingly, however, just at that point, the whole business would usually start skipping. Long story short: the mill never really worked right, and one day, it pretty much broke. Towards the end, however, it did seem that if the mill had been a little heavier and better made, further experimentation would have eventually made it possible to actually produce usable I-cord. The first part below is the theory. If all you want is the plain how-to, skip down to part 2: tips for using the machine. Part 1. The Theory of the I-cord Mill. The I-cord mill is basically a tiny knitting machine. Now, knitting machines often seem very mysterious to hand knitters. Why do knitting machines use crochet hooks for Pete's sake, and what's with the little latches? And how in the world can you knit with so darn MANY of those hooks? It would be difficult for a machine to duplicate these motions: The work would have to slide in exact increments to a precise spot so the knitting mechanism could draw the new loop though each old loop in turn. Then, each already-worked stitch would have to be slid away again. At the end of each row, the work would somehow have to be turned, somehow without tangling the yarn, and the process repeated. Easy for the human hand, but the very devil for a machine. To knit by machine, a different kind of needle has to be used: a "latch-hook." Although it looks mysterious, the name pretty much says it all: a latch-hook is a hooked needle which can be latched shut. 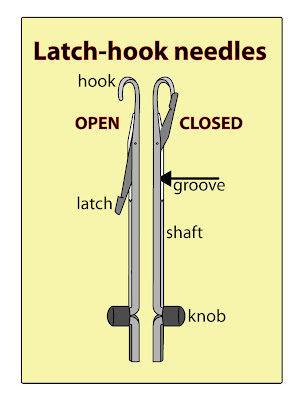 The parts of the latch-hook needles in the Embellish-Knit mill are the hook, the partially-grooved shaft, the knob and the latch. HOOK: The hook part consists of a curved end, like a crochet hook. SHAFT: The hook perches atop a shaft. The shaft has a slot or GROOVE along part of its front. This shaft-groove is where the latch inserts. KNOB: Towards the bottom, the shaft has a knob on the front. As explained below, the knob runs in a track around the inside of the mill. LATCH: The latch is a little arm which swings up and down. It is held into the shaft-groove by a pin which acts as a hinge. In the most upright position, the latch smacks the hook on the nose, thus "closing" the needle--latching it shut. Before we leave the needles to look at the mill itself, does it worry you that the latch doesn't close smoothly onto the hook? It did me. Coming from a hand-knitting background, that latch looked like an accident waiting to happen: one false move and that clumsy-looking latch would snag the yarn. But, as clumsy as the whole set-up looks, it works. The secret is that yarn movement along the latch is directional. The yarn never comes down onto that nasty latch top from above. Instead, the yarn slides along the latch: either up over the top of the closed latch or down off the bottom of the open latch, thus sliding smoothly right past that dangerous-looking little lip. 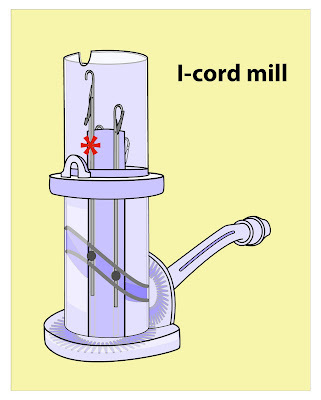 The I-cord mill features two tubes, one inside the other. Each tube, made of plastic, has some stuff molded into its walls. The outer tube is the casing of the mill. One main function is to hold the mill together. The other main function is that it has a track molded into its walls--a circular track which is high on one side and low on the other. The knobs of the needles sit in this track. The inner tube also features molded plastic: into its outer walls are molded slots, and the latch hook needles slide into these. This method of connecting the latch-hook needles to the inner tube is quite clever: the needles are held at a fixed distance from one another, but they remain free to slide up and down. At the bottom of the inner tube are the mechanical guts of the mill. The inner tube rests on a gear wheel, and this gear-wheel connects to the handle-gear. When you crank the handle, the interlocking gears make the inner tube spin. As the inner tube with its attached needles go around and around, the knobs at the base of each needle are forced around the circular track. Since the track is high one side and low on the other, and since the needles are free to slide up and down their slots on the inner tube, the needles following the track are forced first up, and then down, then up again. Interestingly, spinning the inner tube with its attached needles is the only thing that requires mechanical energy, the rest of the knitting is actually done by gravity. If you look down on a mill, you will see that there are four needles. As it happens, there are 4 stages of knitting each stitch. This means that as each of the four needles passes a certain position, it is performing one of the 4 stages of mechanical knitting. In order to make the illustrations easier to follow, the needle occupying the first stage position is always marked with a big red asterisk * in all of the illustrations of this post. The four positions (one for each stage) are labeled on the illustration below. Second stage: As the needle passes the second stage position, the sinking needle is forced against a loop of yarn which was put there on the previous round. 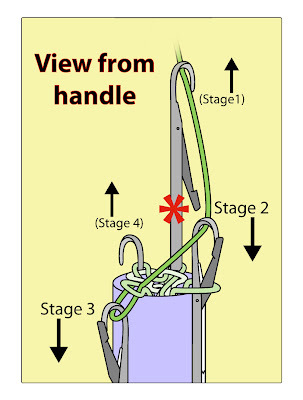 As the needle begins to sink below this loop, the loop catches the underside of the latch and swings the latch shut, thus trapping the yarn which the hook just caught in the previous stage. 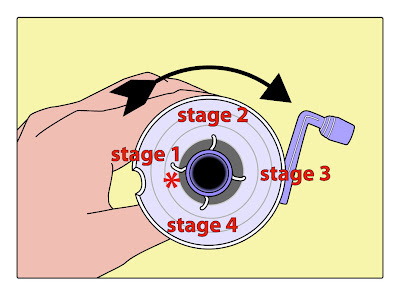 Third stage: The needle reaches its lowest point, far below the rim of the inner tube. The yarn from the previous round slips up over the latch hook, pulled upwards by the path of the yarn through the inner tube. Meanwhile, however, the yarn caught back at stage 1 remains under the hook of the needle, trapped there by the closed latch. Do you recognize this? The fact of the yarn sliding up over the needle is, in effect, the pulling of one loop through another: this is the act of knitting, and stage 3 is where it happens. Fourth stage: The needle starts to rise again. However, the yarn trapped under the hook ever since the latch closed on it back at stage 1, does not rise with it. This is because all the yarn is being pulled down the throat of the inner tube by a weight hanging on the finished I-cord as the cord exits the machine. The weight forces the loop to stay near the rim of the inner tube. As the needle slides upwards, the yarn, staying low, forces the latch open, and, as the needle rises higher, slips free of the latch to stay wound around the shaft. Now we are back to the beginning: we have a needle high in the air, with the latch open. This needle has a turn of yarn around its shaft, and this needle, poised and ready to hook on, is about to pass by the running yarn being fed in at stage 1. 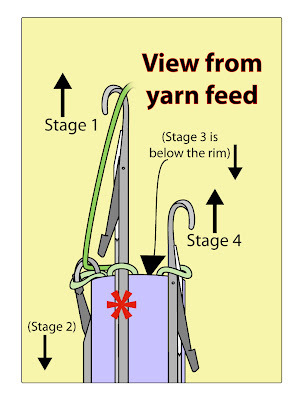 As stated above, these stages depend on one important thing: the yarn disappearing down the throat of the tube must be exerting a pull downwards at all times (this is the gravity part). This yarn (which is actually the I-cord) must always have a weight hanging from it. If there is no weight, there is nothing to keep the yarn headed down the tube, nothing to prevent the yarn from rising into the air as the needle goes up at stage 1; nothing to prevent a horrible, horrible mess from developing. Also, it is the downward tug of the yarn which flips the latches open and shut. Getting started: Run the yarn through the little arch on the front of the machine, over the notch in the rim, then down the throat. Clip the weight onto the protruding tail and rest it on a table. Trap the yarn being fed it with one finger against the outer barrel of the machine. You can now control the yarn feed by barely lifting the weight free, while barely lessening the pressure of your finger. There must be some weight to pull the yarn downward, but until you get some yarn on the needles, you have to manually control the feed. Turn the handle until the first hook catches the yarn. Turn further until the second hook is just about to catch. With a crochet hook, lift the yarn up so the second hook passes under the yarn. Turn the handle and allow the third hook to catch the yarn, lift the yarn and allow the fourth hook to pass. From here on in, you let every hook catch the yarn, and you do not need to control the feed any longer. make sure the LATCH has cleared. Loose Yarn: Tip number 1, the most important tip of all, is that, once you have the machine started, keep the yarn being fed in LOOSE. If there is any tension AT ALL, the mill will skip. This means you have to pull out swoops and lengths of yarn as you go, piling it somewhere safe as you work. This really cannot be overstated: ANY amount of tension is too much--even pulling yarn out of a center-pull ball is too much, even feeding yarn into the mill directly from a yarn swift is too much. The mill will not work correctly unless the yarn being fed in comes off a LOOSE PILE of yarn. Put the cats out, and pile up the yarn. 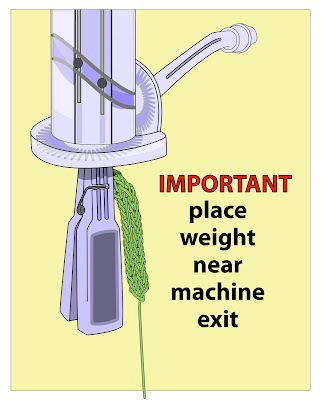 Keep the weight clipped on high up, near the machine exit: Next most important:as stated above, keep the weight on the cord being knit. The mill comes with a handy weighted clothes pin you simply clip onto the tail. Keep moving this clip up to the very top of the cord--just where it comes out of the mill. The thicker/heavier the yarn, the more often the clip has to be repositioned. In any weight yarn, if you let the clip get too far from the machine exit, it starts swinging around in wild loops as you turn the crank, and the needles start skipping. 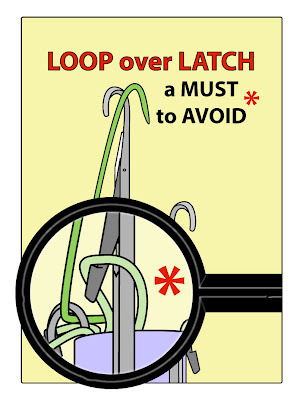 Loop over latch: The last of the big-three tips is to make sure the latch comes open EVERY TIME a needle moves into the stage 1 position AND that the bottom of the latch rise up CLEAR of the loop. If the latch does not rise up high enough to come free of the loop around the shaft -- illustrated above -- you will get a horrible loopy mess. Best practice would be to start off very slowly, holding the mill to eye level and watching the latch on every stitch that goes by. If the yarn is not sliding down below the bottom of the latch, you must poke it down. Then, tug the I-cord coming out at the bottom and re-position the weight so that there is sufficient tug to hold the loop down as the needle rises, thus opening and freeing the latch as the needle rises into the stage 1 position. Yarn guide: Feed the running yarn in under the yarn guide (the little arch on the front of the outer tube), otherwise, skipped stitches. Tangling: The feed yarn wants to tangle with the I cord. To prevent, feed the yarn in from up high, like a shoulder-height bookshelf. Coming from above, the feed yarn cannot tangle with the I-cord coming out of the bottom. Excessive cord length: The cord gets long fast and starts sweeping the floor, a bad idea. It'll get dirty, and the drag makes the mill want to skip. Double the cord back on itself (knot it, use a bobby pin, safety pin, whatever). When the cord gets to an uncontrollable length, I cut it. It is easy enough to graft the cord together: just put each of the 4 stitches on a dpn as if it were a tiny row and graft as usual. Also, if the cord gets too ridiculously long, the excess weight starts to cause problems. One-ply yarns present a special problem: You can mill these, but they're hard to start because the yarn keeps wanting to break when you first put the weight on. Mini Mochi is like this, so is Brown Sheep single ply Lamb's Pride worsted. Instead of starting with a single tail of yarn, crochet a chain of yarn long enough to hang down the throat and clip the weight onto the chain. Hook one of the crocheted loops around the needle in the first stage position, skip the next needle, catch the yarn on the next needle and skip the last needle. Hang the weight and carefully start turning. Sometimes the yarn will still break, but usually, the crocheted chain means that several strands are holding the weight, not just one, so there is less tearing. Weight and kinds of yarn: The real issue is not so much the designated weight of the yarn you want to mill. Rather, the FLUFFINESS of the yarn makes the most difference. The hook might split a fluffy yarn so that the yarn doesn't stay caught under the hook as it should, and this makes a horrible mess. If you use a smooth yarn and keep a sharp eye on the latch of the needle at stage 1 you can mill worsted weight yarn (the kind of yarn usually knit at 5 stitches/inch). However DK is less nerve-wracking, while baby or sock yarn goes along a mile a minute. Limber up the machine: When you first get it, ithe lubricant has been globbed on in one or two spots, rather than being spread around. Also, the gears are a bit stiff. So, before trying to mill yarn, take the mill out for a little test-run: without threading in any yarn, just crank the handle maybe 50 or 75 times and admire the gear mechanism which makes the needles go up and down. Also, if the hinges don't swing freely, consider a drop of plastic-safe lubricant on the end of a Q-tip, wiping up the excess so you don't grease up your yarn. Cleaning: The space between the first and second tube is open. After milling out a bunch of i-cord (?? guessing here--maybe 50 yards? maybe more?) the dust from the yarn will have mixed with the lubricant on the track to make the mill hard to spin. Needles will start to skip and the whole mill will feel rough. I myself simply took the machine apart--there are screws all over--cleaned it, lubricated the track and the hinges of the latches and reassembled. (I wiped everything down pretty well, too, so as not to grease up my yarn.) To keep track of what everything looked like and where all the pieces were supposed to go, I took photos and notes at every stage of the process. Here is a photo showing I-cord milled in all weights. The gray yarn to the left is 1-ply Brown Sheep worsted weight. This is the heaviest yarn the mill is capable of working, and it took some doing: three tries to get started, and use of the crocheted chain trick to prevent tail breakage. This relatively fluffy yarn required to be pulled down by hand every single turn for the first six or eight inches because the weight was not initially equal to the task of holding down yarn of this bulk. As the I-cord got longer, its added weight helped with the correct operation of the mill, and after a foot or so had been made, the working went much faster. However, it was clear that the closest attention would have to be paid for the entire length of cord: the yarn was at the very outer limit of the mill's capability, and it often seemed that the hook would split the yarn. The point of milling this was to show the machine's capacity: this isn't really a yarn for milling under ordinary circumstances. 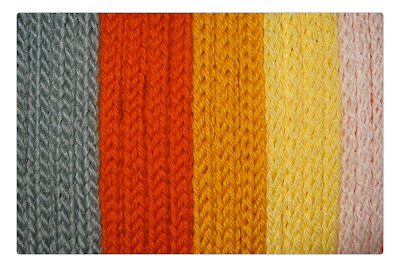 The red yarn is 4-ply Cascade 220, a worsted weight, the gold colored yarn is Dale of Norway Heilo, a DK weight, the yellow is Dale of Norway Baby Ull (Baby/sock weight). All three were easy to start and easy to mill, although the Cascade had to be fed carefully and have the latch cleared a few times by pushing down the loop around the shaft. ADDENDUM, November 2012: A lovely commenter, Lynne, sent along a link to this WONDERFUL You-tube video of trick for churning out I-cord faster than you can imagine, turning the mill at high speed with a POWER DRILL. I am in awe. Thank you Lynne for the link, and thanks to Dutch Hollow Acres for the video! You have been reading TECHknitting on "Using an I-cord mill: tricks and tips." 35 years of tricks want out of my mind & into yours. Why block hand knits? Here's why (and how)!